CalPERS has a legacy of leadership and innovation in emerging manager investment strategies. We've been investing with emerging managers directly and through fund-of-funds for more than 25 years. View our Events for opportunities to engage with us. For more information on our efforts in emerging, transition, and diverse manager investing, review our 2012 Emerging Manager Five-Year Plan (PDF). The new Emerging and Transition Manager 2020 Plan (PDF), beginning July 1, 2017 and ending June 30, 2020, focuses on six key initiatives intended to maintain CalPERS leadership in emerging and transition manager programs, and build on the success of the initial Five-Year Plan. Emerging managers are generally defined as newly formed or relatively small firms. Several CalPERS asset classes have emerging manager definitions based on assets under management and/or length of track record. Below are the parameters for emerging managers based on asset class. Through the Emerging Manager Program, we hire advisors who construct portfolios of smaller asset management firms for CalPERS. If you're an emerging manager and would like to submit an investment proposal, you may reach out to one of the emerging manager advisors below or complete the Investment Proposal Submission directly through CalPERS. Below are the parameters for transition managers based on asset class. Visit the CalPERS Facebook page. 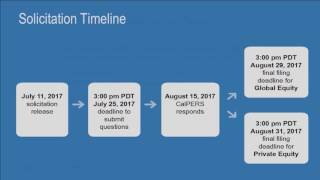 Visit the CalPERS Twitter page. Visit the CalPERS YouTube channel. Visit the CalPERS LinkedIn profile. Visit the CalPERS Instagram page. We serve those who serve California.